Alluring rumors of Pine Siskin enticed me to visit Van Cortlandt Park this weekend, but alas, just like every other time I’ve chased rarities there, I came up empty. New York City’s third largest park simply covers too much acreage, 1146 to be precise, with too few landmarks by which to chart sightings and too few birders to announce them. This is not to say that I didn’t spot lots of fantastic birds. I certainly did, but they were all the same species spotted the last two times I visited, Rusty Blackbirds and all. Nonetheless, the weather was bright, if not a bit too brisk, and I had a great time snapping pictures of the gregarious titmice, sparrows, and chickadees. The highlight was some decent shots of a natty Northern Shoveler. The Northern Shoveler (Anas clypeata) is, as you can see, a very handsome duck, at least as far as the drakes go. The male in breeding plumage sports an iridescent green head, white breast, rufous flanks, and black feathering from back to tail. The female is, in typical dimorphic duck fashion, completely drab, mottled brown and buff. Both sexes have bright orange legs, rarely on display. Though a quick glance may call to mind Mallard, this species is actually more closely related to Blue-winged and Cinnamon Teal, sharing distinctive sky blue upper secondary coverts visible in flight. However, plumage is not the feature most likely to give this duck away. The Northern Shoveler is named for its huge honking shovel of a bill, a proboscis far more pronounced than those of its peers. That large, spatulate bill and comb-like teeth allow this wetland loving omnivore to strain a wide variety of food items, including small crustaceans, mollusks, insects, seeds, and vegetable matter, from the muddy shallows it frequents. The shoveler supplements its diet with larger fare like snails and tiny fish. This dabbler has been known to dive on occasion, but primarily filters food at the surface of the water. Shovelers are a fairly successful species. In winter, they can be found throughout most of the United States, predominantly southern and coastal areas, as well as parts of South America, North Africa, and Southern Asia. 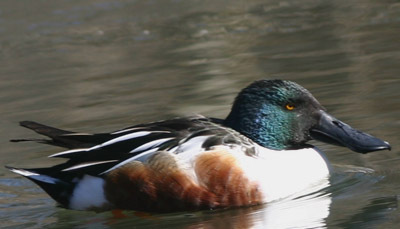 The Northern Shoveler’s breeding range is usually described as northern Europe and Asia along with the western portions of North America. However, reports indicate that some shovelers do breed in the eastern U.S.
As a final point, I’d just like to assure readers that not all shovelers boast as baleful a glare as the one above. He, naturally, is a Bronx bird! Ahh, the Shoveler. We have had a cold snap here on the West Coast, and the ponds are frozen. As I walked around my usual bird haunts, observing the changes wrought by the weather, I noticed a sadness. Upon reflection, I realized it was the absence of the venerable Shoveler. A stylish, yet hard working duck. I hope they have not gone far. What Is This Tern Doing?